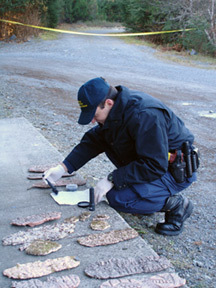 The Alaska Law Enforcement Training Academy (ALET) is offered by the Alaska Department of Public Safety in cooperation with the University of Alaska Southeast Sitka Campus. The ALET program meets training requirements of the Alaska Police Standards Council for employment as Alaska State Troopers, municipal police officers, fire marshals, airport safety officers, and numerous other sworn law enforcement positions within the state of Alaska. This intensive 15-week program is offered in both fall and spring semesters. Instruction is provided by commissioned (sworn) officers and civilian instructors from across Alaska and across the nation. Training subjects include criminal justice, investigations, traffic violations, communications, defensive tactics, and use of firearms. Students completing the session receive an Occupational Endorsement in Law Enforcement. Admission is extended on a first come, first served basis to qualified students able to complete the rigorous application process. Therefore, students are encouraged to apply early. Contact the Sitka Public Safety Academy for details. Students are required to reside at the Academy while completing the 16-credit Justice course requirements. No portion of this course work may be transferred from another institution.